The Marine Corps may have drawn down its forces in Afghanistan to less than 7,000 personnel this year, but they continue to run daring operations with the elite troops they have left. One of the latest examples is Operation Helmand Viper, a muscular effort to strike Taliban fighters in Zamindawar, a violent region between Musa Qala and Kajaki districts that we’ve covered several times on Battle Rattle this year. 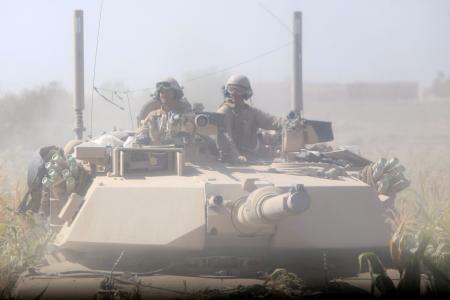 As this new Marine Corps news release points out, tanks with Bravo Company, 2nd Tank Battalion, out of Camp Lejeune, N.C., rolled in support of special operators Oct. 19 to 27, striking multiple targets. The release does not describe the composition of the special operations force involved, but it seems likely it included both Afghan commandos and coalition forces. It’s clear that Zamindawar is one of those areas of Afghanistan that the U.S. will never truly clear of enemy activity given the amount of troops they currently have. As I pointed out in a story this spring while embedded nearby in Helmand’s Kajaki district, it seems more likely U.S. forces will continue to monitor the area, gather intelligence and launch occasional forceful operations like Helmand Viper to keep the insurgency guessing. One example: In May, Marine forces launched another mission, Operation Jaws, killing at least 50 insurgents in and around Zamindawar in the process, Marine officials said at the time. Since then, however, the Taliban strengthened in northern Helmand after Afghan National Security Forces were put in the lead this summer. Numerous Marine grunts who served in Kajaki — which borders Zamindawar — in August and September told me many of those Taliban gains occurred near Zamindawar. Stay hard, my fellow Marines. Keep your head down and your chin up, and stay alert. Ditto, to our Great U.S. Marines!!!! And for our ANA partners, crawling time is over, its time to walk!